A dragstrip is a facility for conducting automobile and motorcycle acceleration events such as drag racing. Although a quarter mile is the best known measure for a drag track, many tracks are eighth mile tracks, and the premiere classes will run 1,000 foot (304.8m) races. The race is begun from a standing start which allows three factors to affect the outcome of the race: reaction time, torque, and traction. Brainerd is a city in Crow Wing County, Minnesota, United States. Its population was 13,592 as of the 2010 census. It is the county seat of Crow Wing County, and is one of the largest cities in Central Minnesota. Brainerd straddles the Mississippi River several miles upstream from its confluence with the Crow Wing River, having been founded as a site for a railroad crossing above said confluence. Brainerd is the principal city of the Brainerd Micropolitan Area, a micropolitan area covering Cass and Crow Wing counties and with a combined population of 91,067 as of the 2010 census. The Brainerd area serves as a major tourist destination for Minnesota, and Baxter is a regional retail center. At 6,000 acres (24 km²), North Long Lake is one of the larger lakes in the Brainerd Lakes Area of the U.S. state of Minnesota. The National Hot Rod Association (NHRA) is a drag racing governing body, which sets rules in drag racing and hosts events all over the United States and Canada. With over 40,000 drivers in its rosters, the NHRA claims to be the largest motorsports sanctioning body in the world. In 1973 Jerry Hansen bought the track and renamed it Brainerd International Raceway. It played host to CanAm races in 1970, 1971, and 1972. These races were won by, respectively, Denny Hulme, Peter Revson, and François Cevert. Denis Clive "Denny" Hulme, was a New Zealand racing driver who won the 1967 Formula One World Drivers' Championship for the Brabham team. Between his debut at Monaco in 1965 and his final race in the 1974 US Grand Prix, he started 112 Grand Prix, resulting eight victories and 33 trips to the podium. He also finished third in the overall standing in 1968 and 1972. Peter Jeffrey Revson was an American race car driver and heir to the Revlon cosmetics fortune. He was a multiple Formula One race winner and had success at the Indianapolis 500. Funny Car is a type of drag racing vehicle and a specific racing class in organized drag racing. Funny cars are characterized by having tilt-up fiberglass or carbon fiber automotive bodies over a custom-fabricated chassis, giving them an appearance vaguely approximating manufacturers' showroom models. They also have the engine placed in front of the driver, as opposed to dragsters, which place it behind the driver. Shirley Muldowney, also known professionally as "Cha Cha" and the "First Lady of Drag Racing", is an American auto racer. She was the first woman to receive a license from the National Hot Rod Association (NHRA) to drive a Top Fuel dragster. She won the NHRA Top Fuel championship in 1977, 1980, and 1982, becoming the first person to win two and three Top Fuel titles. She won a total of 18 NHRA national events. Frank Hawley is a two-time World champion drag racing driver. Bob Glidden was an American drag racer. He was retired from Pro Stock racing in 1997 and returned in 2010. Glidden retired as the driver with the most wins in National Hot Rod Association (NHRA) history at that time — a feat recently topped by 16-time Funny Car champion John Force — and he was the third-most successful drag racer of the professional class drivers — sixth when counting sportsman national event winners — at the time of his death. Glidden won 85 NHRA National Events. In the Professional classes, he was behind Force (147) and Warren Johnson (97). Currently, Glidden ranks fourth behind Greg Anderson (90). Glidden's ten Pro Stock championships included five in a row beginning in 1985. Among his numerous accomplishments, Glidden won nine straight NHRA national races in 1979 and was the No. 1 qualifier 23 times in a row, including the entire 1987 season. At one point, he won 50 eliminations rounds in a row. Kenny Bernstein won at Brainerd five times, 1983 and 1987 (in Top Fuel Funny Car) and in 1991, 1996, and 2002 (in Top Fuel Dragster)). Brainerd International Raceway consists of 2 road tracks and 1 drag strip. Brainerd International Raceway maintains the original name of the now 40-year-old course. The course is used for automotive and motorcycle racing. The 3.1-mile Donnybrooke Road Course has 10 turns and is considered wide – the main straight is 60 feet wide. There is essentially no elevation change. BIR is a high-speed course; vehicles can reach speeds of nearly 180 mph and take the slowest corners around 80 mph. There are wide runoff areas at most of the corners, which makes BIR's road course extremely safe. This configuration uses the dragstrip as part of the course. The 2009 racing season was the first for the 2.5 mile course which was completed the previous summer. Turn 1 on the 2.5-mile Competition Road Course is the same as Turn 1 on the three-mile road course. Turn 1 is a narrow but very high-speed banked right-hand 60-degree turn, which is intended be taken flat out by all vehicles. Turns 1 through 8 of the original 3.1-mile road course are used for the new circuit. At Turn 8, a 240-degree right-hand Clover Leaf transitions drivers from the old course to the new stretch of asphalt that winds its way back across the infield, eventually tying back into the original circuit just before Turn 1, avoiding the dragstrip. In all, the Competition Road Course features 13 turns and very little elevation change. Drag racing is a type of motor racing in which automobiles or motorcycles compete, usually two at a time, to be first to cross a set finish line. 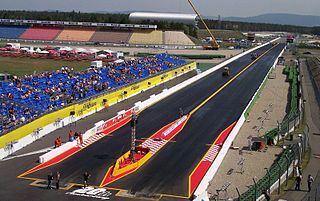 The race follows a short, straight course from a standing start over a measured distance, most commonly 1⁄4 mi, with a shorter becoming increasingly popular, as it has become the standard for Top Fuel dragsters and funny cars, where some major bracket races and other sanctioning bodies have adopted it as the standard, while the 1⁄8 mi is also popular in some circles. Electronic timing and speed sensing systems have been used to record race results since the 1960s. Don Prudhomme, nicknamed "The Snake", is an American drag racer. Frank Manzo, nicknamed "Ace", is an American funny car drag racer, named to the 2010 American Auto Racing Writers & Broadcasters Association All-America Team. Old Bridge Township Raceway Park, originally known as Madison Township Raceway Park, is an American auto racing facility located in Old Bridge Township, in Middlesex County, New Jersey, United States,, in the New York metropolitan area. Tom McEwen was an American drag racer who was a winner of the National Hot Rod Association (NHRA) U.S. Nationals. His racing career spanned 45 years. He is ranked at number 16 on a list of the 50 most significant drivers of NHRA’s first 50 years. The NHRA Winternationals are an annual drag racing event held by the National Hot Rod Association (NHRA) at Auto Club Raceway in Pomona, California. A dragster is a specialized competition automobile used in drag racing. The Hot Rod Magazine Championship Drag Races were a series of drag racing events sponsored by Hot Rod Magazine between 1961 and 1969. It was considered "one of the most significant drag racing events" of that era. Ronnie Scrima is an American dragster and funny car chassis builder. The Logghe Stamping Company is a dragster and funny car fabricator based in Detroit, Michigan. Ed McCulloch, nicknamed "The Ace", is an American dragster and funny car driver. The NHRA Summernationals are an annual drag racing event run by the National Hot Rod Association (NHRA). The 1978 NHRA Summernationals were a National Hot Rod Association (NHRA) drag racing event, held at Englishtown, New Jersey, on 16 July. Vallco Professional Drag Racing was a card-based drag racing game invented by Greg Zyla in 1963. Gaspar Ronda, better known as Gas Ronda, was an American drag racer. He was also a restaurateur. In 2016, Ronda was made a member of the International Drag Racing Hall of Fame. Pawnbroker is a pioneering rear-engined dragster built in 1969. Doug Thorley is an American Funny Car drag racer, hot rodder and businessman. In 1967, he won the NHRA Nationals' first Funny Car Eliminator title, and was given Car Craft's All-Star Drag Racing Team Funny Car Driver of the Year Award in 1968. Hot Rod magazine describes him as "one of drag racing’s most famous early era drivers." Dale Emery, nicknamed "The Snail", was an American drag racer. Emery raced Fuel Altereds and Funny Cars, and briefly in wheelstanders, as well as serving as crew chief for several top teams. ↑ "World Stadiums - Stadiums in the United States :: Minnesota". 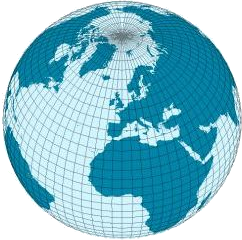 www.worldstadiums.com. ↑ "Brainerd International Raceway". Champcarstats.com. 1969-09-14. Retrieved 2009-09-19. ↑ Richardson, Renee (July 28, 2006). "BIR sold". Brainerd Dispatch. Archived from the original on July 18, 2011. Retrieved April 9, 2011. ↑ FOX. "Brainerd, Minnesota twisted by storms, raceway in pieces". ↑ The Summit Racing Web Development Team. (2005-08-13). "BRAINERD - Saturday Wrap Up". Dragracecentral.com. Retrieved 2009-09-19.